Almond flour, rice flour, and arrowroot powder. With ingredients like that, who would’ve thought these would be the most scrumptious brownies of all! After the tasty, but less than amazing results of Part 1 and Part 2, the Part 3 brownie recipe of the vegan brownie review has reigned supreme, so to speak. 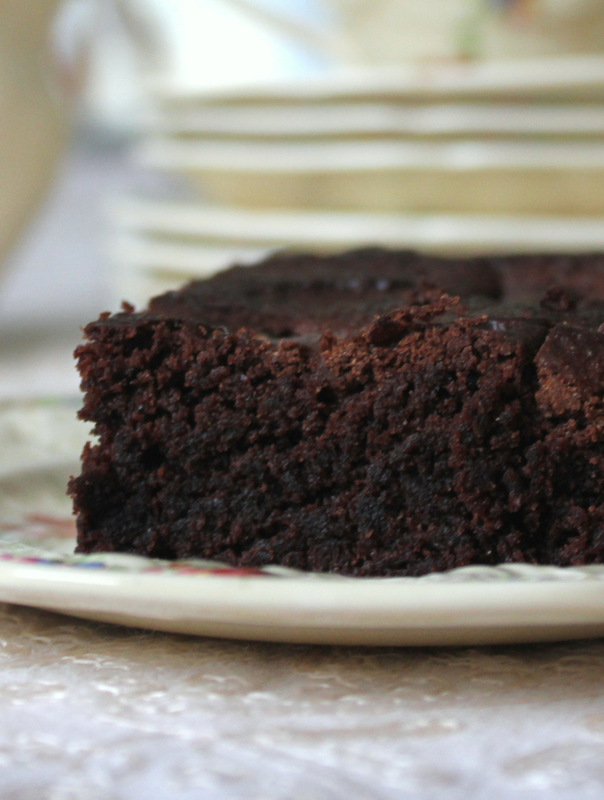 Vegan, gluten-free brownie: You are understated and never overrated as the vegan brownie champion! The recipe came from the ever-popular vegan blog “Oh She Glows”. Cakey or Fudgey? : Fudgey as any other. A great dense texture without being *too* much like fudge. Ease of preparation: The ingredients are obscure if you’re not a regular gluten-free baker. But I promise, you’ll want to make these again and the extra ingredient purchases will be worthwhile. Overall taste (Scale of 1-5, 5 being out of this world and the best I’ve ever tasted): Scoring a full point ahead of the last delicious recipe, I give ’em a 4.5. 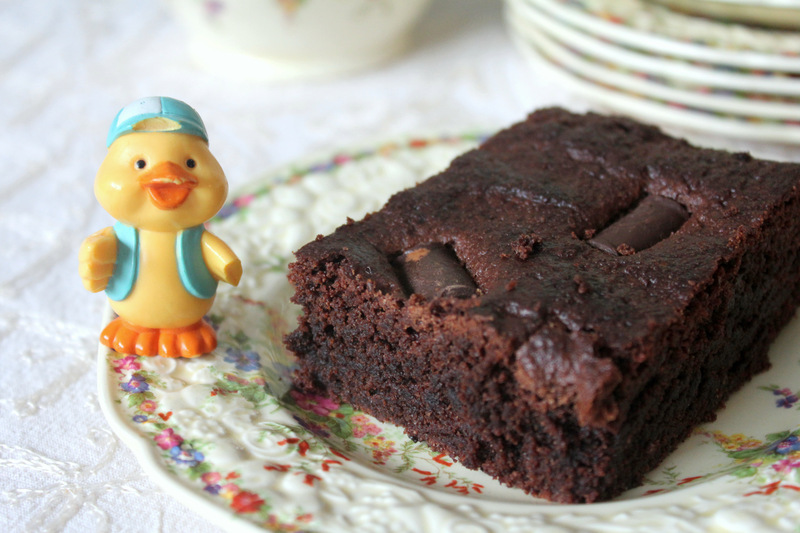 The first bite had me questioning flavour – you get a quick hit of almondy flavour before the chocolate fully kicks in, but every bite after that is nothing but brownie heaven. These were taste-tested on 3 other very willing participants who agreed they were super tasty even in comparison to most “regular” brownies. Did I mention these are not only vegan, but gluten-free? I know it’s almost Spring and far from Winter festivities, but the weather is making me crave cozy meals. Most of my friends and family have Thanksgiving and Christmas dinners that consist of turkey, mashed potatoes, stuffing, etc. This year my family Christmases had those things plus more. Being the vegetarian of the group, I usually bring my own dish with enough to share. This year’s dish brought on the “Mmm”s and “Ooh”s. 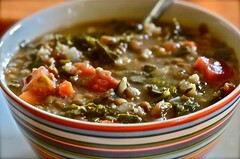 It was a vegan lentil stew adapted from vegan chef and cookbook author, Chloe Coscarelli. Hers was featured in a handy nytimes blog post along with the recipe and two more recipes for soul-delighting vegan holiday mains (for those internet newbs, click the link to read the post and recipes). It’s a lentil stew with the sweet and spicy flavours of apple, sweet potato, and curry powder. Oh yes, curry, but it doesn’t taste just like an Indian-style lentil curry. It’s got a different vibe. The curry is subtle in the background and is balanced with the richness of the vegetable broth and green lentils that simmered in it. The original recipe calls for squash instead of sweet potato and spinach instead of kale. I put a little of my own preferences into it – and let’s face it, squash is a bit more difficult to peel than a potato (any tips on peeling butternut?). I recommend you give these flavour combos a try. What other ingredients do you cook using curry? There’s a whole curry world out there, and someone’s gotta eat it. p.s. Sorry for the lack of pics. Today is a quick afternoon post kind of day. Most people have made a smoothie before (right?) but everyone has their own preferences or things they like to add to create a more nutritious snack or breakfast. I’m not feeling well lately – for the last 3-4 weeks, some time before this vegan challenge. I might have a touch of the flu or some other affliction (went to the doc yesterday). So when I’m not feeling like putting a lot of effort into a morning meal, I make a smoothie! Sometimes I add some ground flax for the fibre – other people like to use hemp or chia seeds. There are so many little add-ins for smoothies to up the nutrient factor. I also like to add a special energizing greens powder that is nutrient-PACKED! With the greens powder and strawberry combo, you can expect a brown-ish colour…kind of gross-looking but tasty! 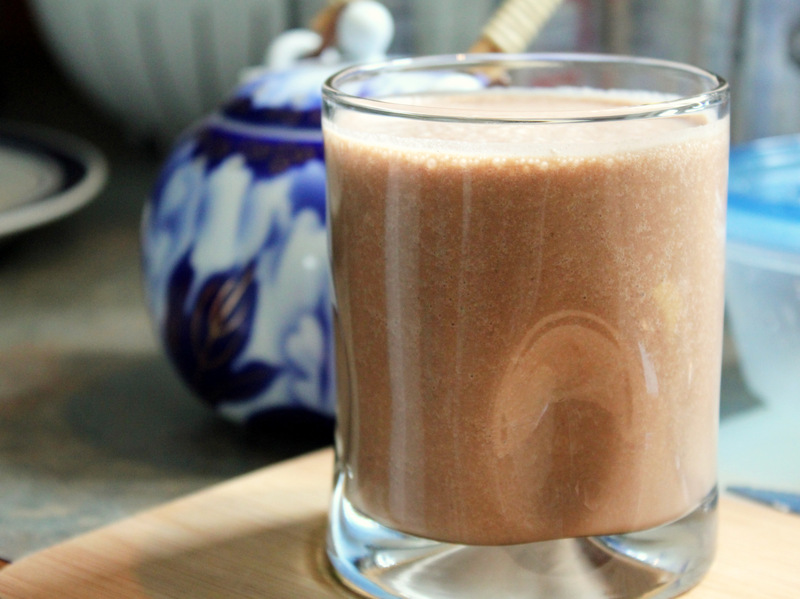 Another favourite of mine is a tasty banana-cocoa smoothie. It makes me feel like I’m eating dessert any time the mood strikes! 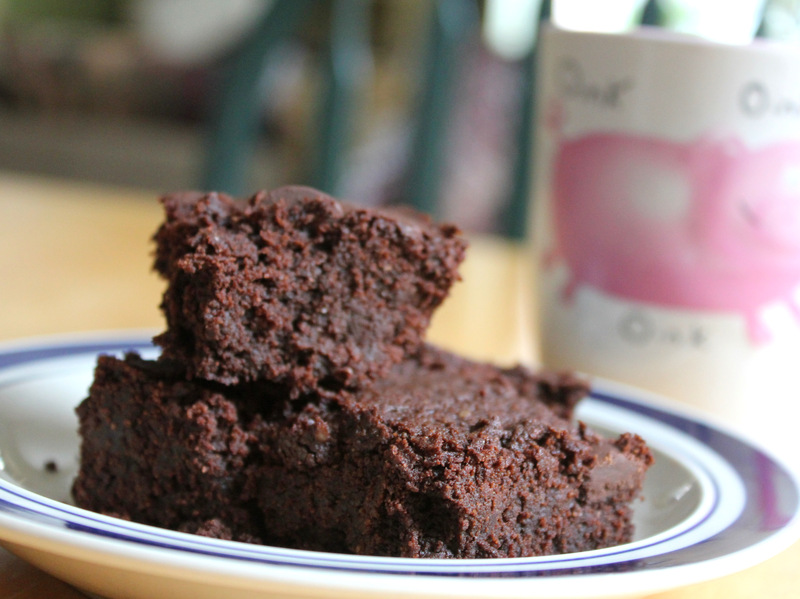 Remember Part 1 of The Vegan Brownie Review Trilogy? As promised, Part 2 is here! This time I made a more complex brownie recipe from jae steele’s book, “Get It Ripe”. This is another book that I borrowed countless times from my local library, only to buy it months later. Sidenote: This book is full of great recipes, but not only that, offers a LOT of helpful nutritional info from a holistic and vegan perspective, cooking and baking technique tips, and more! Cakey or Fudgey? : As I mentioned in Part 1, I like somewhere in between a cakey and fudgey. These would’ve been more fudgey than the brownies in part 1 I think, but I’m pretty sure I over-mixed the spelt flour (it has less gluten and over-mixing can cause it to crumble) and they turned out a bit dry. What with the melted chocolate and the tofu in this recipe, I’d think they’d normally hold together. That said, you might want to try all-purpose flour instead of spelt if you’re worried about over-mixing with spelt. Spelt was used to eliminate conventional wheat from this recipe, which causes allergies for many. 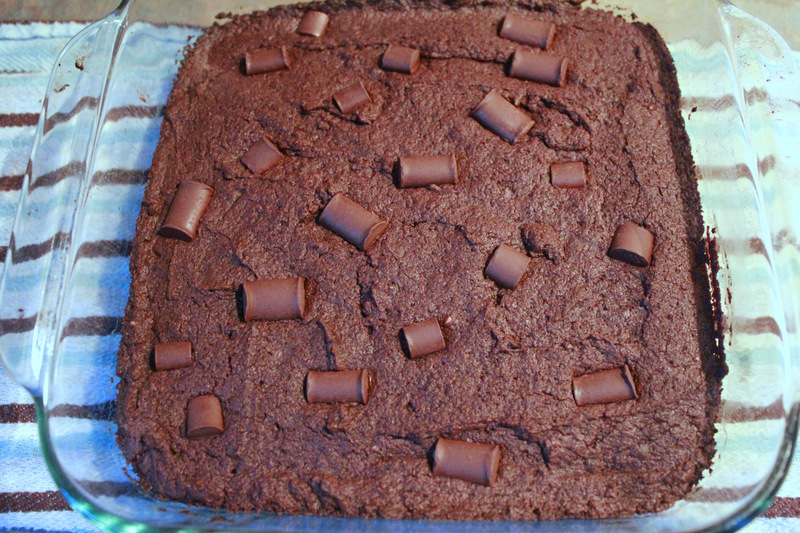 Ease of preparation: These brownies were easy enough to make. There were a couple finicky ingredients besides the spelt (melted chocolate and tofu) which also require a double-boiler set-up and a food processor or blender. But other than those, the rest of the ingredients were your basic straight-forward brownie fixin’s. Not difficult! Overall taste (Scale of 1-5, 5 being out of this world and the best I’ve ever tasted): I give ’em a 3.5. I took off .5 for the texture (due to my over-mixing or mis-measuring, I’m pretty sure) wasn’t as it should be, but the flavour was excellent! Even as a crumbly brownie, these were great with coconut ice cream (such as the vegan brand “so delicious”) or the coconut whipped cream I made. I would recommend trying these out! Since the ingredients are a bit different from your traditional brownie recipe, it’s a fun experiment. 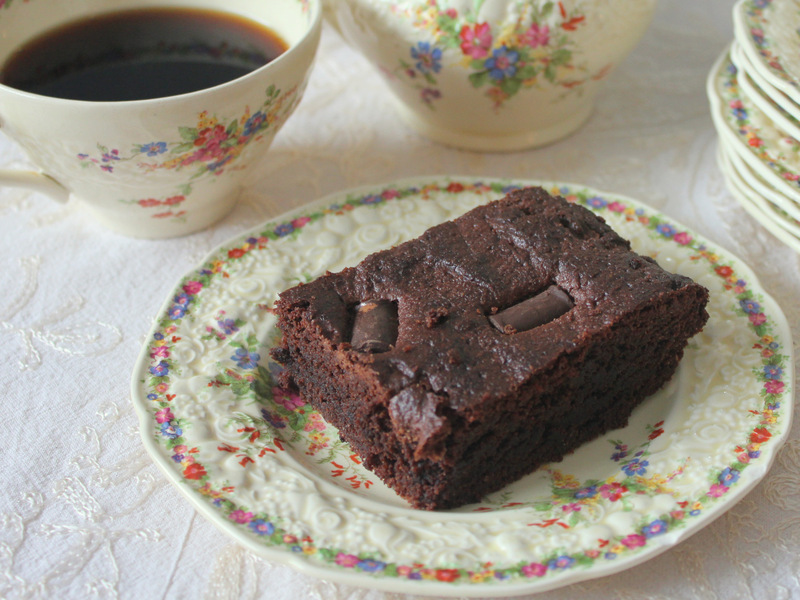 And if it works out texture-wise, the flavours are as rich as any other brownie I’ve tried. If you try them and the texture works out, I’d love to hear if they held together for you. Part 3 of the Brownie Review Trilogy is on the way and it will be gluten-free. Let’s see what happens! We’re on March Break! Yes, I work in a school and my beau is a soon-to-be teacher himself, so we are off for this week (without pay, but off nonetheless). And what this means is that I have more time to eat (vegan) pancakes. 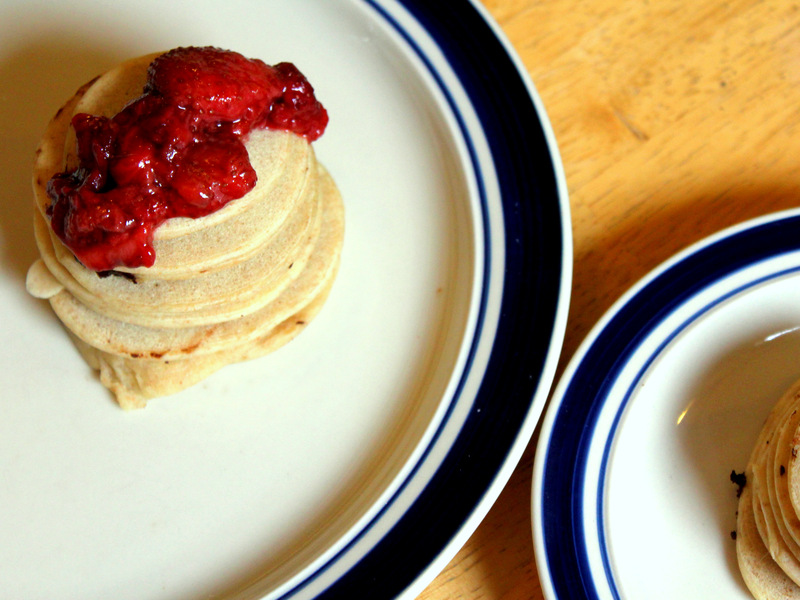 Pancakes are just about the easiest food to make vegan, but I use this vegan recipe. It’s an oldie but my go-to every time I make pancakes (which isn’t often enough, I figure, since I don’t have the recipe memorized). 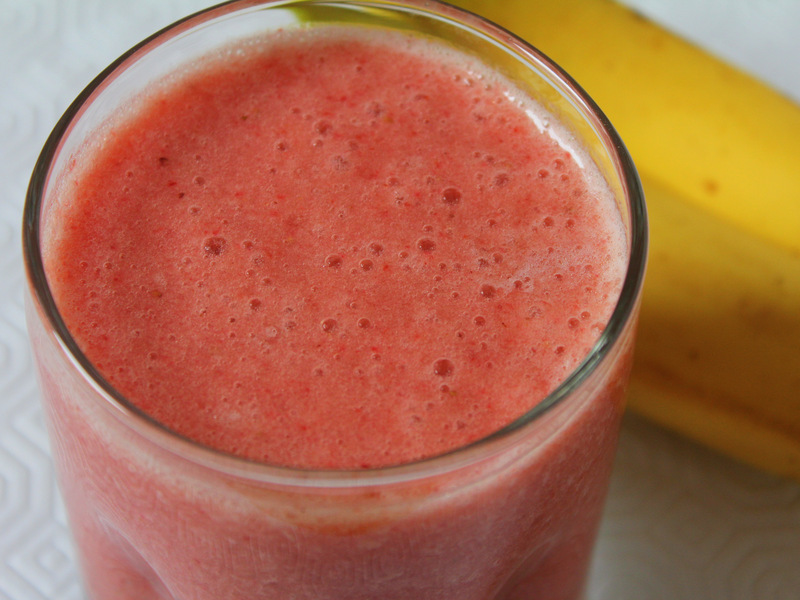 The coolest aspect of this recipe is that you make it in a blender! No more stirring, just throw everything in and blend away. 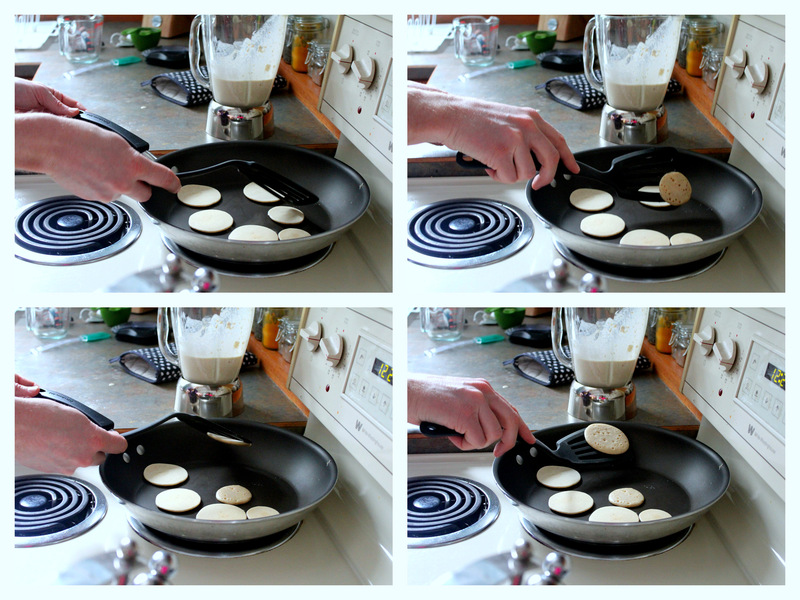 Want pancakes the next morning but not with-it enough first thing to get out ingredients and follow steps? Just blend it up the night before and put the blender pitcher in the fridge overnight. My beau actually made these pancakes for me and did a fantastic job. They were thin, cute, and slightly chewy (in a good way). 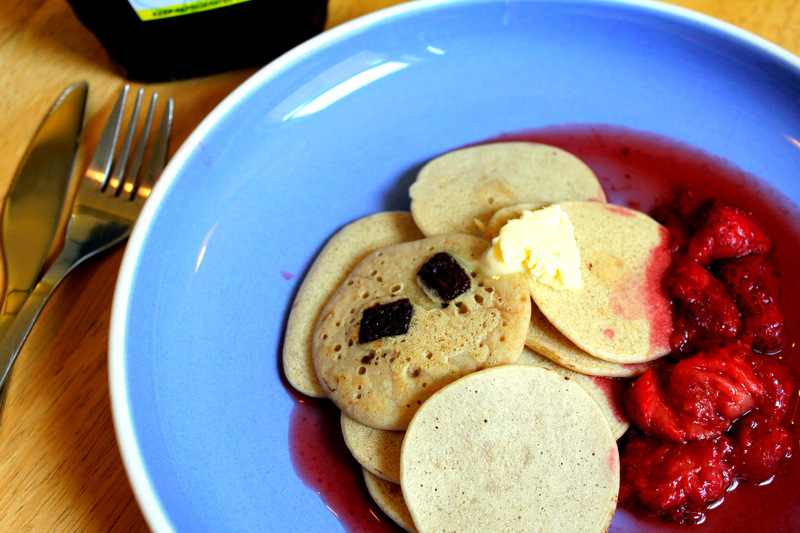 We had them with strawberry sauce (aka strawberries defrosted and smooshed up in a saucepan). P.S. I know that it’s starting to appear that I mostly just eat vegan cheezey foods, brownies and pancakes, but I promise I eat lots of other more beneficial foods too! I just like to share with you all the things that are vegan AND fun! You know, like, more fun than salads? Want a Sweet Treat? Man, Go Eat a Mango! Until recently I would only buy bags of already cut, frozen mango. Then I saw some whole mangos on sale for a good price and bought three! I had been too lazy or disinterested to figure out how to pick a good mango and actually cut one. Eating a ripe, fresh mango is such a tasty experience. When the juicy sweetness hits my taste-buds it transports me to a tropical fruity heaven of some kind. Yes, I’m being a little corny. But honestly, for me , no other fruit can provide such an elated feeling! In general, fruit is like natures fast food. It often comes in its own edible wrapping. It’s easy to grab and go. And it’s a scrumptious mid-day snack. Mangos are a little different in that they need to be peeled and they can be quite messy – not the best fruit-on-the-go option. That’s why I have taken to eating mangos as a dessert, at home. I like to cut it up all fancy-like, and eat it with a bit of dark chocolate and scoop of coconut ice cream (yes, all vegan!). 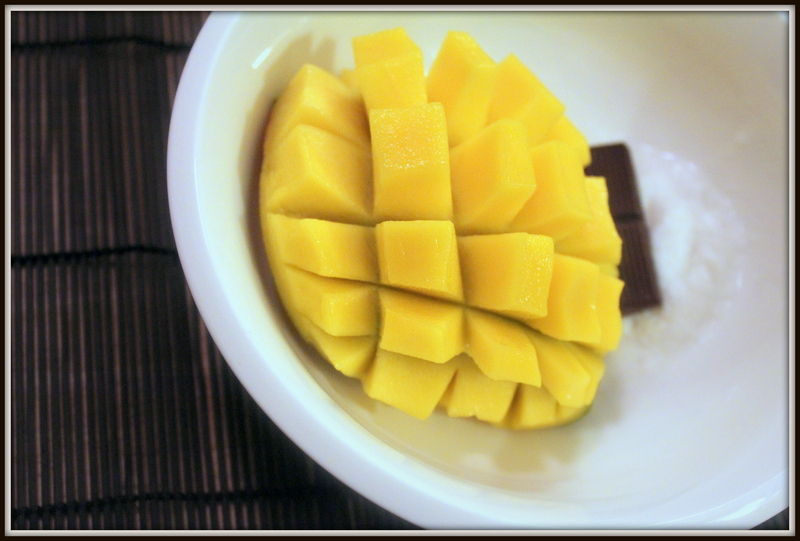 Want to make your mango look all fancy too? 1) The mango has an oblong shape, a bit like a squishy egg shape. You’ll want to start by cutting off each of the wider, flatt-ish sides (which will become the attractively diced fruit you see above). Watch out for the pit! Mangos have a stone a lot like a peach, but bigger and oblong, just like the fruit it lives in. You’ll have to cut the flesh off as close to the seed as possible (you’ll hear a kind of crunching sound and the knife won’t glide easily when you hit it). 2) After cutting off each of the fleshier flatter sides, you can slice off the other parts, so as not to waste any of the yummy fruit (I just eat this part right away, ’cause who can wait?). 3) Now you should have two flatter, fruity sides to work with. Much like cutting an avocado, if you’ve ever done that, you’ll want to hold the oblong half in your palm – flesh up, skin down. Now run the knife through the flesh vertically, just until you hit the skin (but not through the skin!). Do the same thing horizontally, making a checkerboard pattern. Now you’ve got your dice! 4) Gently push the skin side so it’s now concave and the inner flesh is now a convex shape with diced chunks sticking out of it (as pictured above). That’s it! It’s so pretty and impressive. 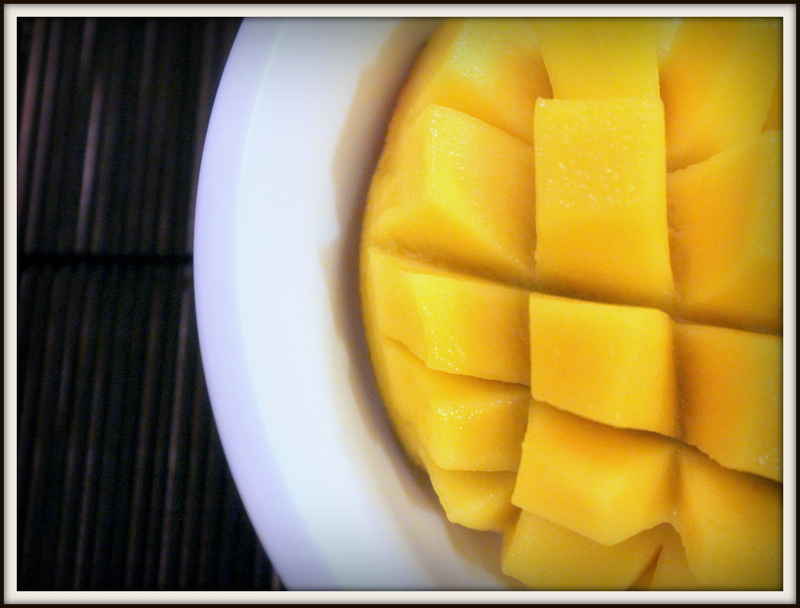 You can do this for your own enjoyment or present your beautiful mango dessert to your dinner guests. Such a sweet treat to behold!